Self Finance Scheme In Medical Colleges Pakistan by HEC (Higher Education Commission). 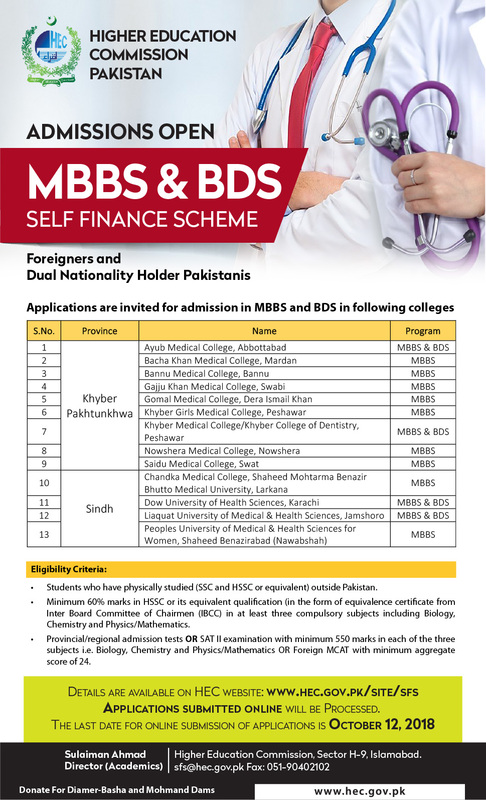 Self Finance Scheme In Medical Colleges Pakistan for admission in MBBS and BDS. HEC (Higher Education Commission) of Pakistan announce a Self Finance Scheme In Medical Colleges Pakistan. The advertisement for Self Finance Scheme In Medical Colleges Pakistan is given below in this post. All information related to Self Finance Scheme In Medical Colleges Pakistan is given below in the advertisement. • Students who have physically studied (SSC and HSSC or equivalent) outside Pakistan. • Minimum 60% marks in HSSC or its equivalent qualification (in the form of equivalence certificate from Inter Board Committee of Chairmen (IBCC) in at least three compulsory subjects including Biology, Chemistry and Physics/Mathematics. • Provincial/regional admission tests OR SAT II examination with minimum 550 marks in each of the three subjects i.e. Biology, Chemistry and Physics/Mathematics OR Foreign MCAT with minimum aggregate score of 24.